Savitri Temple, being dedicated to Lord Brahma's consort, is possibly next in importance only to the main attraction of Pushkar, the Temple of Lord Brahma. 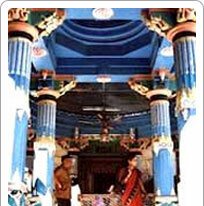 Savitri temple is exactly behind the temple of Brahma Temple and is located on top of a hill. Several steps have to be climbed to reach the temple. The climb is rewarding, as the temple has a panoramic view of the Pushkar Lake as well as sand dunes and other temples in the town. When Lord Brahma was set to start the Yagna at Pushkar (the location was decided upon after dropping a lotus flower), Savitri's presence was required. But She kept Him waiting. Lord Brahma, became annoyed and married Gayatri the milkmaid, so that the yagna could commence at the most auspicious moment. Savitri cursed Lord Brahma that he would not be worshipped anywhere except in Pushkar. Therefore, the only temple dedicated to Lord Brahma is found in Pushkar.